1989 was twenty years ago. Although the realization had set in when Sub Pop claimed those numbers a year ago, twenty being the number where "modern" becomes "antique," the idea that an album like Bleach, (or a band like Nirvana), could reach the point of "classic" is humbling to someone like me. November 3rd, Bleach is being reissued in honor of its twentieth year. It will be released as both a CD/double-LP with new artwork (as in "never seen before") and a live performance (as in "never heard before"). 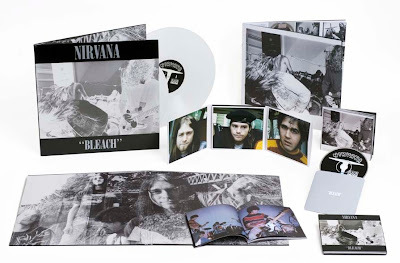 The double-LP will be available in white vinyl, as was the case when Bleach had been first pressed twenty years ago. Since you're here, why not entertain some nostalgia and listen to "About A Girl." It's still a great song.